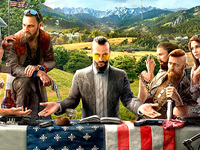 Far Cry 5 is set in the fictional Hope County, Montana, where a preacher named Joseph Seed (portrayed by Greg Bryk) has risen to prominence. Seed believes that he has been chosen to protect the people of Hope County from an "inevitable collapse" and has established a congregation called the Project at Eden's Gate. Ostensibly, this is to fulfill his mission of leading the people to salvation; in reality, Seed is a radical preacher and Eden's Gate is a militaristic doomsday cult. Under his rule, Eden's Gate has used both coercion and violence to forcibly convert the residents of Hope County, and intimidation to keep them from contacting the outside world for help. When an attempt to arrest Seed ends with the abduction of several lawmen, the player is swept into the armed conflict between Eden's Gate and the remaining Hope County residents, who are organizing themselves into a resistance movement.